Nautica Designer Handbags. Nautica Maritime Travel Tote Bag in gray weather proof canvas and green accents and trim. 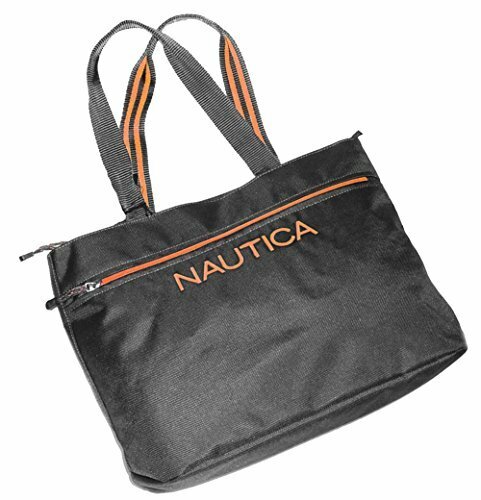 The Nautica shoulder bag measures about 13.5 H x 20 W x 6.75 inches deep. The double web straps measure about 24 inches each. The Nautica travel tote is fully lined in nylon cloth with one zip sidewall pocket. The exterior has one large zip pocket across the front of the bag. The Nautica shoulder tote is light weight and the perfect bag to use for travel, work, sports, school or play. This item is new with tags.